Arthritis, sometimes referred to as osteoarthritis or degenerative joint disease, is the most common health issue amongst older dogs. In most cases it simply comes as a result of years of use of the joints, leading to your dog’s body simply wearing out over time, just as with us humans. It’s important to be aware of the signs and symptoms of arthritis so you can catch it early and begin the process of treatment so as to put your dog through as little pain as possible. We’ve already looked at natural remedies that can help heal the pain of arthritis, but what are some other treatment options? How can you tell if your dog is showing signs of arthritis? Firstly, you’ll notice a definite change in the way they move. They will be reluctant to move and will take much longer to sit down or get up than they used to. This change can happen slowly over time, so it’s easy to miss the signs, but eventually they will be difficult to ignore. 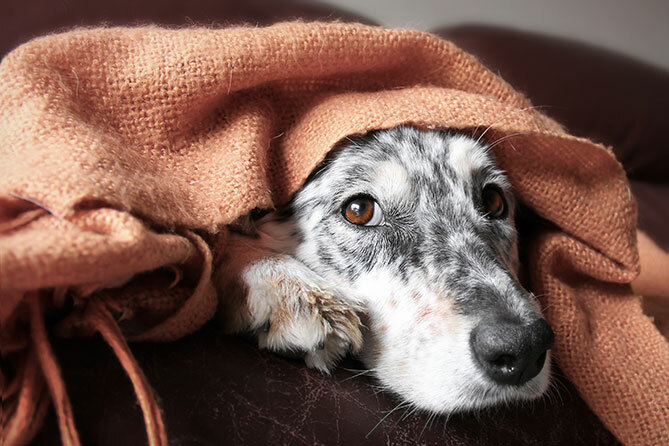 Our article here outlines some more signs that show a possibility of arthritis in your dog. Your vet will give you final confirmation as to whether your dog is truly suffering from arthritis. It’s important to not be stressed or worried if your dog has arthritis. Remember that it’s a common disease, and there are some things we can do to help relieve the pain of arthritis in our best friends. After all, no loving dog owners wants to see his or her dog in pain. Just like humans, proper nutrition allows doggy’s bodies to perform at their very best. A highly nutritious diet can help your dog’s joints to stay in good form, and some foods can provide natural sustenance for the joints. Fish oils and essential fatty acids are known to help in encouraging and maintaining joint health. Glucosamine also helps with building and repairing cartilage in dogs. Portion size is also very important here so as to maintain a healthy weight range. Keeping your dog’s nails and paws in good shape will help them remain comfortable when on their feet, thus minimising strain on joints. If you neglect your dog’s feet, they may end up in a lot more pain and be unable to distribute their weight properly, further fuelling the discomfort of arthritic symptoms. Regular exercise is important for all dogs. First and foremost, it keeps their weight down, which is a cause of early onset arthritis and worsens the pain as joints are overloaded. Gentle exercise is important for dogs who are already suffering from arthritis, but having them move around will keep their joints lubricated and muscles strong enough to support themselves. Hydrotherapy is a form of exercise or therapy in a heated pool of water. Warm baths or hydrotherapy exercise can help aid with pain management, as the weightlessness will help take the load off your dog’s joints. Watch them receive a welcome relief from the pain! Just like their owners, dogs can benefit from a form of physiotherapy so as to help keep their limbs operating and relieve strain in the muscles and joints. Gently massaging your dog can ease the pain of arthritis and relax joints and muscles, giving your dog some relief. Your vet can show you some gentle massage techniques to apply on your dog at home. With tender arthritic joints, sitting and sleeping can be made much more difficult for your pup. Providing them with extra cushioning will therefore help them be more comfortable and deal with the pain more easily. Heat is good for relieving joint pain, and you can purchase pet-specific heat pads that are designed to help apply heat to your dog’s problem areas. Make sure that their bed is always warm enough, particularly in winter, as the cool air is not helpful for a doggy’s bones and joints. Arthritis can make it difficult for your dog to walk, and the more they need to use their muscles and paws, the harder the joints have to work. Laying down carpet or rugs can therefore provide some much needed grip, helping to reduce the load on their muscles and joints as they don’t need to stabilise themselves as much. Stairs may have been okay in the past, but as your dog gets older and shows arthritic symptoms, it’s likely they won’t be able to use them as well as before. Ramps can help dogs navigate your home much easier, as a straight incline is always less painful than climbing a step. Vitamins such as C and E can help relieve joint pain, as can glucosamine, which helps with repairing and forming cartilage. Ayurvedic ingredients such as turmeric and ashwagandha are also known anti-inflammatories that can bring relief to arthritic pets. Non-steroidal anti-inflammatory drugs (NSAIDS) are a common treatment for arthritis in dogs. They do, however, have some side effects, so it’s best to discuss whether your dog requires them or not with your vet. Adequan injections are another possible treatment. These can help repair cartilage and slow down the deterioration of joints. Alternative therapies are becoming a favourite in this new century, and this doesn’t apply only to humans. Acupuncture can help relieve tension in your dog’s body, giving them an opportunity to relax and release endorphins. It works by concentrating on the energy points within the body, using needles to obstruct or encourage the flow. With so many approaches to managing arthritis and helping your dog live a more comfortable life, it’s important you speak to your vet so as to understand the best course of action for your pet in particular. It’s heartbreaking to see dogs less mobile than they used to be, but they will appreciate the love and attention you provide for them as they age. For even more natural ways to ease the pain of osteoarthritis in your dog, check out our article on natural remedies. Pet insurance provides the security of knowing that no matter what happens, you’ll be prepared. Learn more here.